It’s been long since I made a post on user interface rules! In this post, I am going to explain about, how to configure a navigation rule. What is a navigation rule? You might have seen this in all the websites where you can click and move to another screen / page. Let’s see it from the facebook site. On the left panel, you can see the navigation points where you can click and open the respective pages. So navigation is purely an user interface rule which can be used to navigate in any pega user portal. 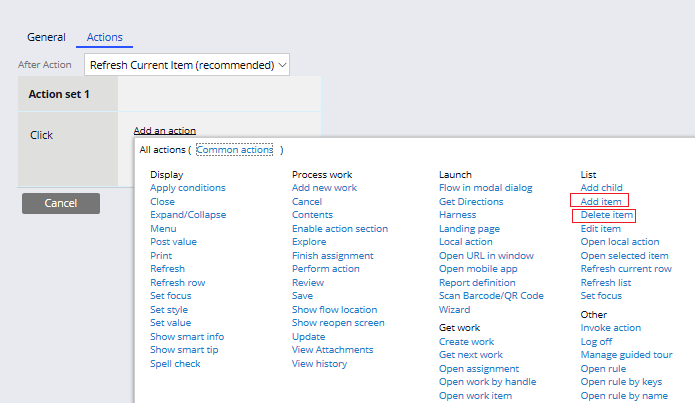 First let’s explore how pega used their OOTB navigation rules in their application. I hope I mentioned this in my previous posts – If you find it difficult with any rule type in Pega, just go and explore the OOTB inbuilt rules. Which rules can refer the navigation rules? Normally section can refer the navigation rule with the help of menu control! So, now the next question is, Where do we use the menu control? a) From section rule advanced options. You can drag and drop the menu control and refer the navigation rule in the menu control properties. You can use menu action. In the menu action / control, you can refer the navigation rule. 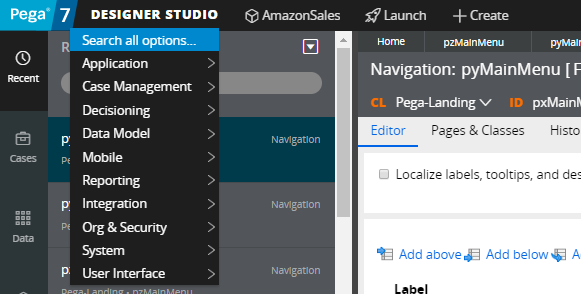 How pega used the navigation rules? You can click on the designer Studio and navigate to various options. Let’s explore how pega built it. Step 1: Use the live UI. Place it on the designer studio and click the pointer icon to open the rule. Step 2: You will the section ‘pzDesignerStudioMenu’. Now, you should have guessed, how it is implemented?! 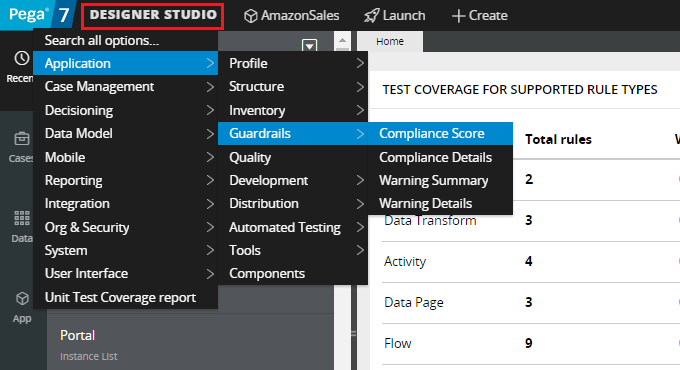 Step 3: You can verify, by clicking the Designer Studio link properties. Step 1: Launch the default manager portal. Step 2: Use live UI on the left panel and open the section. Step 3: you will see the section ‘pyPortalNav’ with menu control. 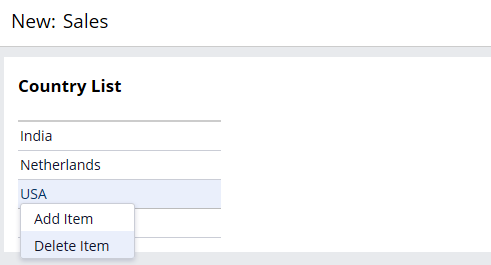 Step 4: Click and open the menu control properties. You see the menu bar directly refers the navigation rule. What are the configuration points in navigation rule? Looks very short?? – Cool, one navigation rule can refer other navigation rules. Think about this landing page – You can see three level hierarchy is in place. a) Label – We all know its usage. To provide description label Eg – Application, Guardrails, Compliance Score etc. b) Type – you can configure the type as 6 options. 1. Item – It is the normally used type. When a node is defined as type – Item, then it performs the actions configured. Eg – usually when the position is last in the hierarchy, then we can configure them as item. 2. 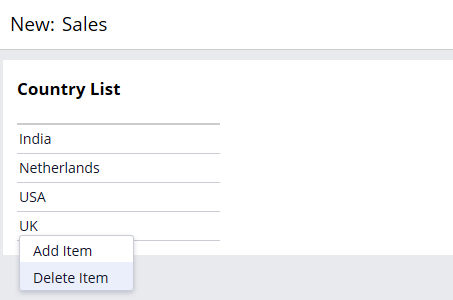 Item List – Same as Item, but when the options has to be sourced from a pagelist / page group property then you can define the type as item list. 3. Reference – This type is used to reference another navigation rule. 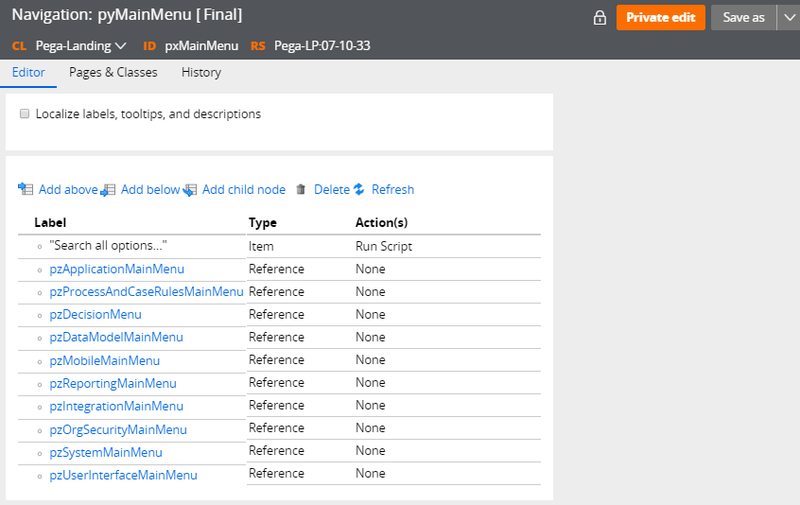 In our example – pzMainMenu navigation rule refers to pyMainMenu. 4. Custom – You can specify an activity to control the behavior. Don’t use it often. 5. Seperator – Use to provide a separator line between options. c) Actions – You can configure what actions to be performed when the node is clicked. Note: Actions are not applicable when node type is reference, separator or Custom. 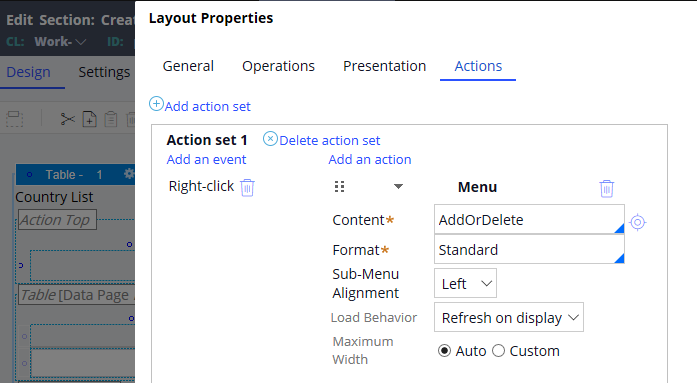 Let’s see, how pega used the types and actions for the designer studio menu. 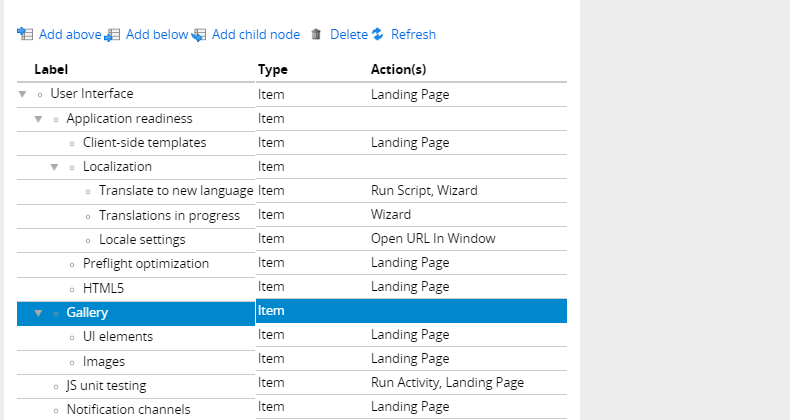 You can see one node is of type – Item (since not child hierarchy) with actions as run script. All other nodes reference other navigation rules. 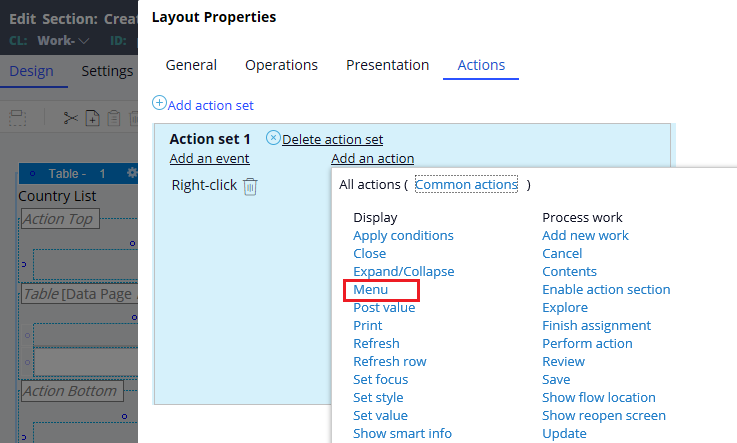 You can see for the all the menu items from applications to User interface, Pega specified (reference) separate navigation rules. Double click on any node to see the configuration. Step 2: double Click on the first node of type – Item and Label – Search all options. On the right side, you see more configuration points. I believe some are self explanatory – for example – Label, tooltip, description, visibility, image source etc. I will be concentrating more on configuring the type and actions. You see the type is configured as Item. Click on the actions tab. You see some script is getting invoked to support searching. You see there are 5 child nodes (hierarchy) for the User Interface. But from the designer studio -> User Interface, I see only four options!! JS unit testing is missing. You might have guessed the reason why?! There must be some visibility condition for the JS unit testing node. You can double click on the node and check on your own. You see the actions – Landing page is commonly used in 4 nodes. 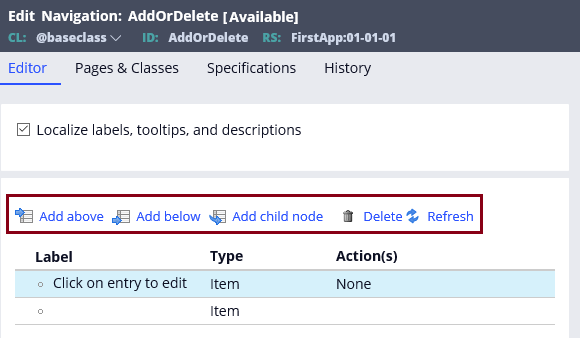 Double click on the parent node – User Interface and go to the actions tab. On click – Landing page. Landing page action uses Harness to load the screen. I will make a post of harness very soon. You can see the harness name – pzLPUIUserScreens. Just to verify, Go the designer studio -> and click on User Interface. Put Live UI on the landing page. 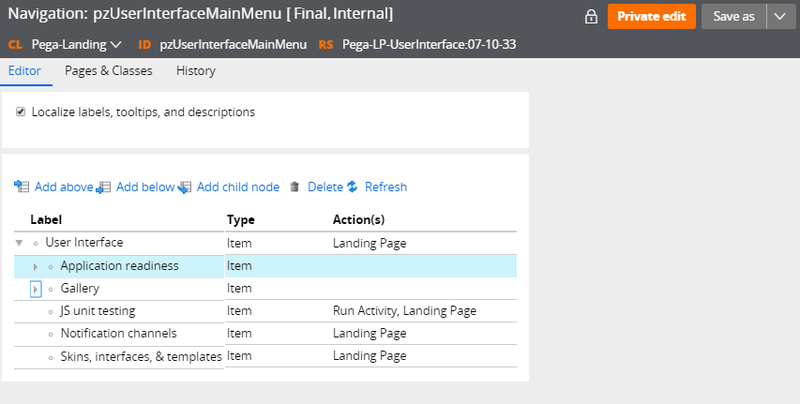 Step 4: You can analyze other child nodes under User Interface category. Expand all the child nodes. You can see some interesting actions like Wizard configured!! If you have a requirement something similar to invoke a wizard, mimic the configurations. I believe, now you can explore all the options in the designer studio menu on your own! 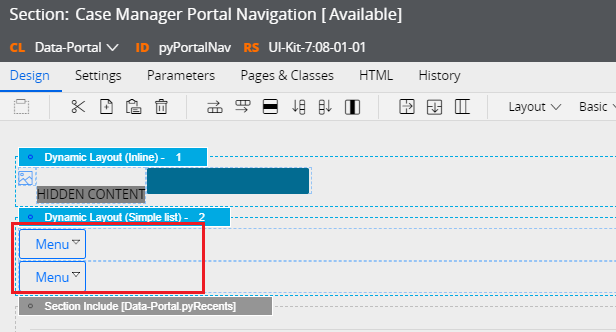 Step 5: Let’s see one more example on the navigation used in Manager portal left menu. Open the navigation rule – pyCaseManagerLinks. 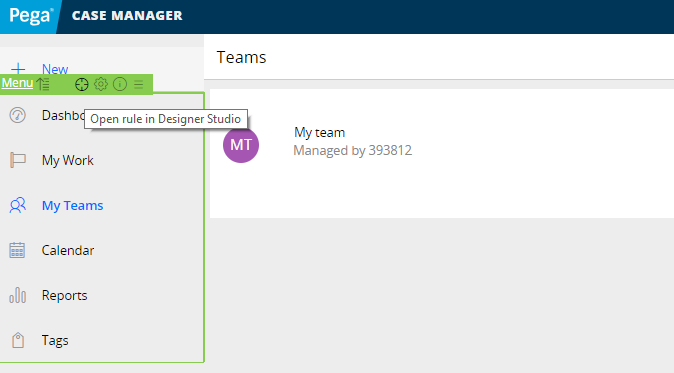 You will all the options as a list in the manager portal left panel. You can also explore the type and actions of individual node. It’s time for a tutorial. Requirement: In a repeating grid, sourced by any list, say countrylist– the user can right click and see a menu where the user can add a new row or delete a new row. Pre-requisites: I am going to use a data type called countries. If you had created any data type before – reuse the same. 2. 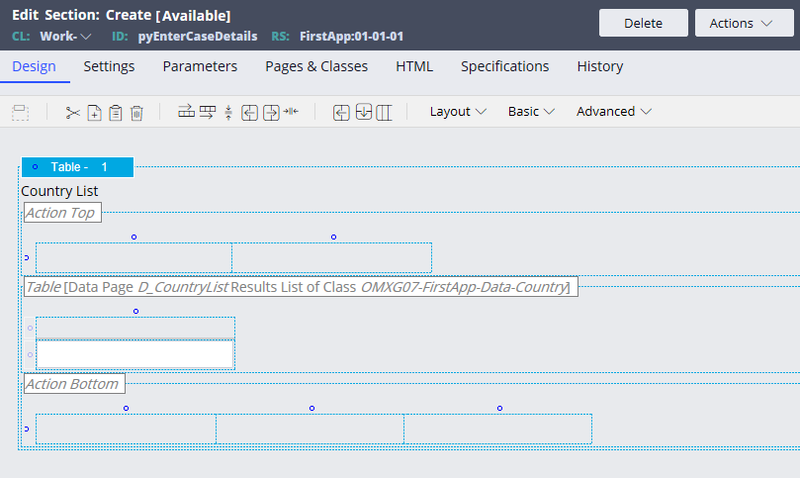 Configure a section in the case stage ( I chose ‘pyEnterCaseDetails’ section to display it in the new harness) with the repeating grid sourcing from the editable data page D_CountryList. From the user portal, it looks like this. So the requirement is, User can right click and add / delete a row from the menu. 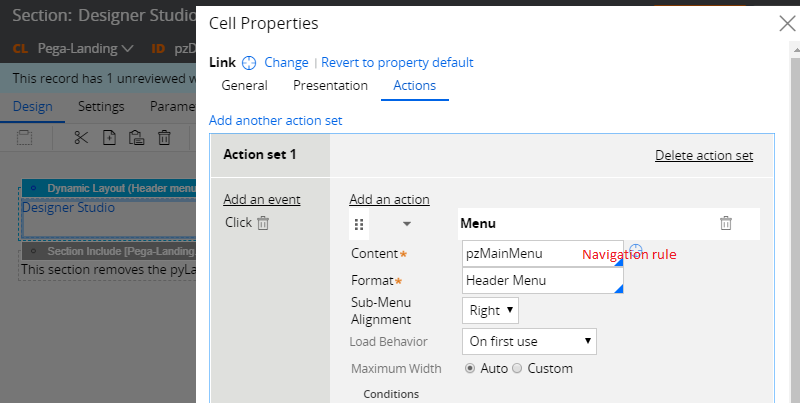 Step 1: Create a new navigation rule to perform the actions – Add / delete in the menu. Step 2: Decide how many nodes and relationship and create nodes. 2 nodes 1 for Add and another 1 for Delete. No parent child relationship. Double click on the first node and configure the label, type and actions. We have successfully created a new simple navigation rule. Step 4: Now refer the newly created navigation rule in the repeating grid. 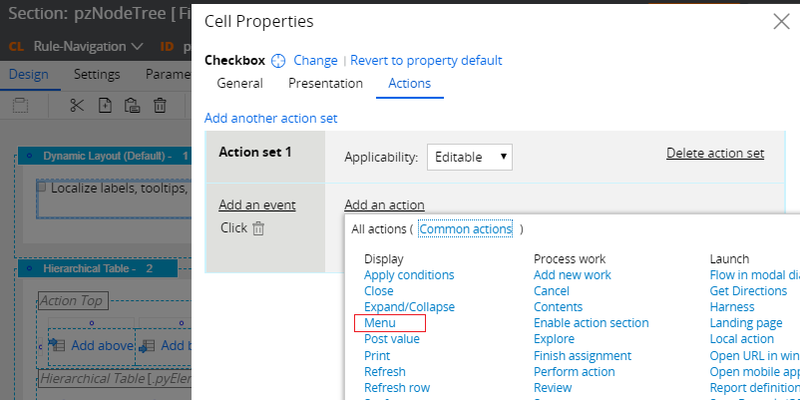 Go to actions tab and configure Menu action for Double-Click event. 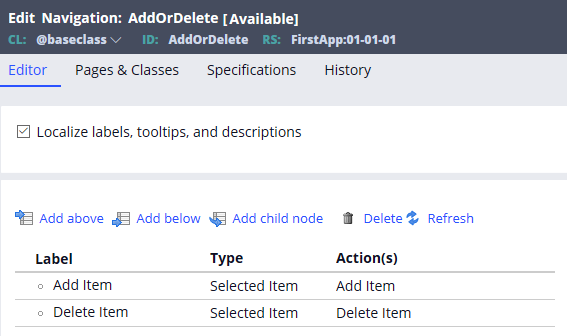 Include the navigation rule AddorDelete. Create the corresponding case and navigate to the screen where you added the grid. Oh Wait!! 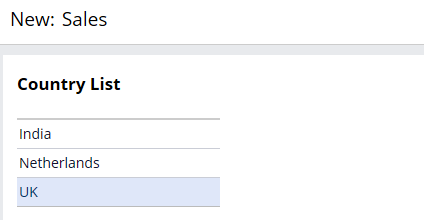 Configure another action as set focus, because I don’t see on which row I clicked. Step 6: let’s test again Right click on USA row. You can see USA row is highlighted, now click delete item. You have seen this right click actions in many places in designer studio. I just explored and mimicked the same in the tutorial :P.
Hope you liked this post!! See ya all in my next post. Take care! 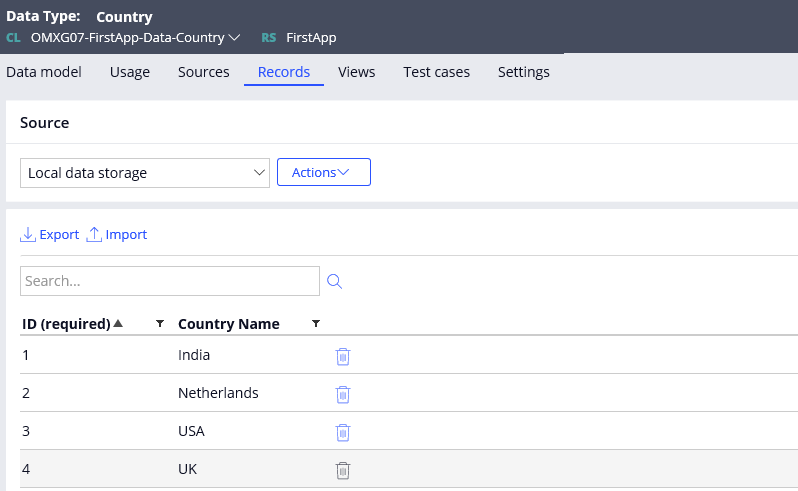 Prem Help me… i have 20000 records for CountryList and i want to display only 14ooo record Name? Useful as always. Thank you for posting this. Let’s suppose we create menu for navigation in the left panel of our portal. The purpose of the menu options is to launch respective harness/section. How to ensure that the harness/section is launched in the right panel of the portal and not in a new window? Super Jii. when can i expect JMS Listener. As expected great post.. thanks buddy. Great post,you explained it so easily. You are really helping people to learn. 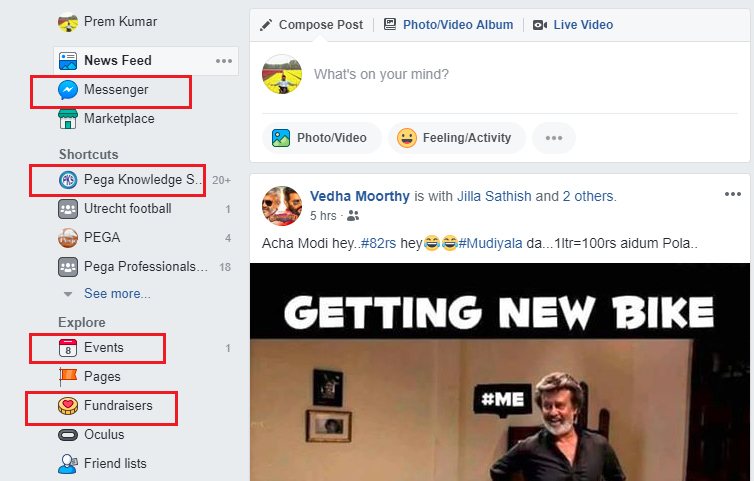 No words for your user friendly explanation that can be understandable to any person who just have basic pega knowledge. Coming to the current post, can you please explain the scenario of Item List with a simple example. Thank you Prem for this valuable information. 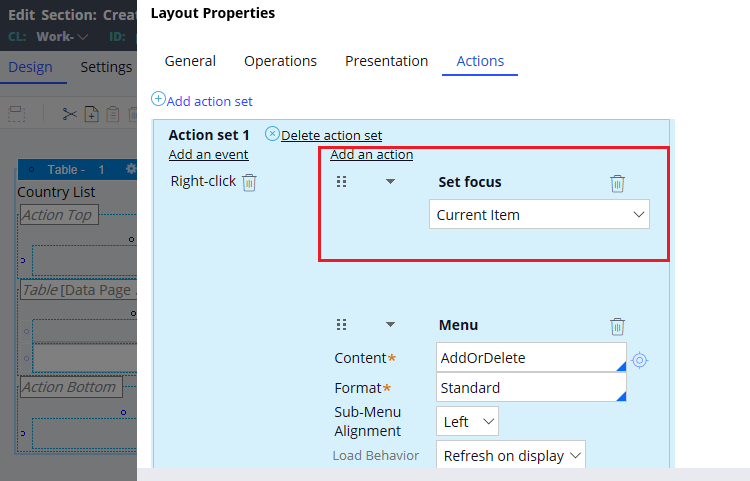 How to configure dynamic layout Pega UI? What are the validation rules in Pega? 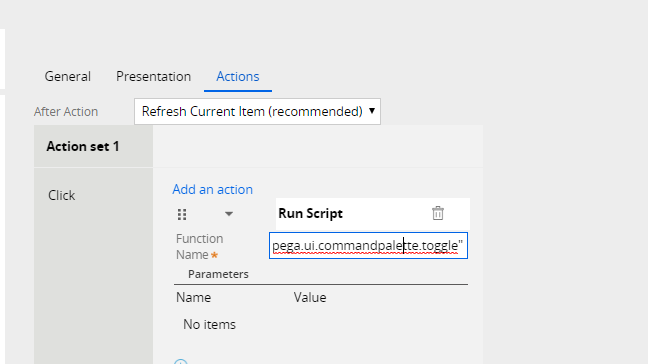 What is float concept in Pega UI?